Have you felt so exhausted after working out or just doing household chores or simply walking around the block? You are not alone! It’s called energy depletion, which is especially common with athletes who engage in extensive trainings and workouts. Runners like me rely on carbohydrates as our main source of energy. It helps our brain and body function properly. As we consume carbohydrates, our body breaks it down into smaller sugar molecules called glucose which are stored in the liver and muscles. It will then be converted to energy to help fuel physical activity. The glycogen in our muscles gets depleted as our physical activity increases, thus a need for more carbohydrates. Eating the right amount of carbohydrates before and after vigorous activities is therefore extremely important. One excellent source of carbohydrates is potato! Thanks to Potatoes USA-Philippines, high quality potatoes are now in the Philippines. US potatoes are classified as a superfood, a nutrient-dense food that can help fuel huge exertions from physical exercise and movement. Potatoes are also high in potassium, even more so than a banana, and are also full of vitamin B6, vitamin C, vitamin E, calcium, iron and magnesium. US potatoes are available in fresh, frozen and dehydrated forms. Fresh potatoes are the pick of the crop, carefully sized and graded based on standards of the US Department of Agriculture (USDA). Frozen US potatoes are premium potatoes quick-frozen in a state-or-the-art process which locks in the flavor and nutrients. They come in all sizes – frozen whole, frozen half-shell and the most popular frozen straight cut, wedges, crinkle cut, lattice, curly for fries and hash browns. Another variant is US dehydrated potatoes, they are compactly packaged and perfect for a wide array of dishes such as soups, stews, sauces and many more. I can’t wait to try new potato dishes! I’m excited to start making recipes for my pre or post run meals. Of course, I’ll soon experiment on old family recipes by substituting frozen potatoes for fresh potatoes! In the meantime, you can click on this link to see recommended potato recipes that can help power athletic performance: https://www.potatogoodness.com/recipe-category/performance/. US potatoes are now available in supermarkets and groceries nationwide. For more information on US potatoes, visit https://www.potatogoodness.com/ or like and follow Potatoes USA-Philippines on Facebook at https://www.facebook.com/PotatoesUSAPhilippines/. Kidneys are two bean-shaped multi-functional powerhouse organs of the urinary system. They expel waste from the body, balance body fluids, release hormones that regulate blood pressure, and control the production of red blood cells. With all those jobs to be done, our kidneys deserve attention and care. The National Kidney and Transplant Institute has reported that Kidney Failure is the 7th leading cause of death among Filipinos and close to an estimate of 30,000-40,000 patients yearly undergo dialysis. Kidney disease often cannot be cured, but fortunately, it can be prevented early by taking care of our urinary tract. With the aid of Old Orchard’s resident US nutritionist, Amy Bragagnini, MS, RD, CSO, here are some tips that can help you prevent urinary tract and kidney infections. Eating Healthy and Exercising Regularly. Diabetes and high blood pressure cause most of the kidney problems. When blood pressure is high, blood vessels stretch to allow blood to flow more easily. The stretching eventually injures and weakens the blood vessels, impairing their ability to clean blood properly, including those in the kidneys. That’s why it is always best to follow healthy eating habits such as limiting intake of sodium (2,500 mg) and sugar, and controlling weight and blood pressure through exercise. Watchful eaters should also consider the addition of calcium-filled food (milk, yogurt, calcium fortified cereals, etc.) to their diet. However, Bragagnini notes that one must not mistake calcium supplements as an alternative to the natural food sources, as it could result to kidney stone formation when taken in excess. If you’re smoking, you should quit now as smoking slows the flow of blood to the kidneys. This results to an impairment to function properly which increases risks of kidney cancer by 50%. Following Directions for Over-the-Counter Medications. Your kidneys can only take so much. Overdoing your medications create high toxins level in the body, posing great burden on the kidneys. So as much as possible, limit yourself from too much chemical exposure. If you really need medications, consult with your physician and follow the instructions well. If diabetes or high blood pressure is in the genes, it is always ideal for you to have your kidneys tested regularly as part of your routine check-up. A creatinine level higher than 1.2 for women and 1.4 for men is a sure sign of a kidney problem. “Fluid intake is another important step to help lower risk of kidney stone formation and urinary tract infection”, stresses Bragagini. Healthy individuals who aren’t suffering present kidney diseases should consume enough water and other fluids of at least 2 liters of fluid per day. Consuming enough fluid helps dilute the urine and helps flush toxins. Bragagini prescribes that pairing a meal with Cranberry juice in moderation is a great way to reduce instances of irritation in the urinary tract. In fact, Cranberries are power packed fruits that are rich in Vitamin C and a source of Flavonoid and Phytonutrient contents called Hippuric Acid and Proanthocyanidin. These power duo components prevent UTI-causing bacteria from sticking into the wall of the bladder and urinary tract preventing further damage to the kidneys. Bragagini closes by saying that the most important thing you can do to keep your kidneys safe is to take care of your overall body to reduce your chances of developing diseases that put a strain on your kidneys. Coupled by prevention, it is also aided by continuously doing consultation with your physician or dietitian. Started in 1989, Madam Lee would bake cookies for her loved ones and friends in her kitchen. But sooner than expected, the cookies has reached Johor Bahur and Kuala Lumpur, and even the nearby country Singapore. Due to the growing demands for the homemade specialty cookies, Madam Lee decided to shift from a manually-handled manufacturing facility to a professionally run, technically-enabled state-of-the-art facility. Furthermore, in order to make it viable for the international market, the brand name The Cookies Factory (TCF) was incorporated. In 2009, The Cookies Factory has successfully obtained the HALAL certification from Malaysia Halal Development Corporation. In the same year, the company was awarded the Hazard Analysis Critical Control Point (HACCP) and Good Manufacturing Practice for Food (GMP) certification by the renowned certification body, Moody International. The Cookie Factory has been rated 4 Stars (SME Competitive Rating on the scale of 5) by the SME Corporation of Malaysia. Each product that comes out of the The Cookie Factory facility has been certified export-ready by the Ministry of Health (MOH),Malaysia. With more than 22 years of experience in the confectionery industry, The Cookies Factory has grown as a premier biscuit and cookies manufacturer based in Johor, Malaysia,, and is one of the leading exporter to Australia, Hong Kong, Taiwan and New Zealand. Currently, The Cookies Factory carries three brands, namely: Skinnie Biscotti, Jaree Finger Biscuits and Town 82K Wheat Biscuits. Enjoy the unique taste, light and crispy texture of the thinly-sliced Skinnie Biscotti baked with premium Californian Almonds in a no oil added recipe. The Skinnie Biscotti is a best compliment to tea or coffee. It comes in three variants, which are Original Almond, Apricot & Pumpkin Seed, and Double Chocolate. Jaree Finger Biscuits is a delicious fun snack that the kids and the whole family can enjoy. Each box of this healthy treat contain fresh-off-the-oven goodness in small packs. It’s transfat-free, cholesterol-free and is a good source of dietary fiber. Jaree Finger Biscuits comes in two variants: Roasted Almonds and Butter & Milk. The TOWN 82K Wheat Biscuits is is a delicious and healthy multi-grain snacks perfect for the vegetarians, as the product is Halal-certified vegetarian. The cookies are conveniently packed and sealed to maintain their freshness, and is also a good source of dietary fiber. Enjoy the TOWN 82K Wheat Biscuits in Original Wheat, Oat Tea, and Natural Black (made with Natural Bamboo Charcoal), Wholemeal Raisin, Chocolate Almonds, Cranberries Oatmeal, Pecan Nuts Chocochips, Chunky Peanut, Crunchy Hazelnut, Melting Almond, and Nutty Green Peas. The Cookies Factory products are now available at SM Supermarkets, Robinsons Supermarkets, Puregold, Rustans Supermarkets, Landmark, Metro Gaisano (Market! Market!, Ayala Cebu and Alabang), and in Mercury Drugstore outlets. The Cookies Factory is locally distributed by Scanasia Overseas, Inc.
Indulge in the guilt-free goodness of The Cookie Factory baked with love. Grab one today! The month of May celebrates World Hypertension Day and besides commemorating Losartan, Lipitor, and Atenolol, there’s a natural and better way to combat hypertension. It is the Big F.
The “Big F” is FIBER. It is derived from plants and scores huge in keeping the heart and colon healthy, for better blood circulation and detoxification. Good blood circulation prevents hypertension. Sapping bad cholesterol and toxins out of the body by consuming fibrous food, such as oatmeal, also promotes digestive health and prevents colon cancer… aside from boosting good blood circulation. The connection continues: did you know that hypertension helps bring about constipation? So fiber up, and you prevent both hypertension and colon problems. Basically, anyone who wishes to gain the benefits of fiber simply has to eat more fruits and vegetables. Fiber may also be sourced from cereals and carbo-loaded food such as oatmeal. There are many variants of oatmeal– instant, quick-cooking, whole-grain rolled oats, and oat bran. Just find the kind that suits your taste and lifestyle most. One brand, Australia Harvest Oatmeal, boasts of best quality as it prides itself in coming from the world’s best oats-growing region, West Australia. Perhaps it is this best-source and superior-quality assurance that made the Philippine Volcanoes— the country’s official rugby team sent to battle in international rugby competitions– choose Australia Harvest Oatmeal as their Official Fiber Partner. And for good reasons. The Philippine Volcanoes just won their bronze medal in the recently concluded Asian Rugby Competition. So celebrate World Hypertension Day this May, by staying healthy and sharing the fitness word. Philippine Rugby Football Union (PRFU) men’s team sticks to what is healthy, energy-packed, and good for the colon as the national Rugby Football team signs up for another round as Australia Harvest Oatmeal’s endorsers. Australia Harvest Oatmeal uses the best oats variety from West Australia and packs peak levels of dietary fiber. Zero pollution, haven for growing the best nature-nurtured oats in the world—this is West Australia. Home to nature, the great outbacks, rugby. And Australia Harvest Oatmeal. “Rugby is one of Australia’s favorite sports; it’s also one of the toughest. In a sport as physical as this, you need to keep your body strong and healthy to win. That’s why our team always starts the day with a bowl of Australia Harvest Oatmeal. It’s made with some of the best oats in the world,” says Team Captain Jake Letts. Besides promoting healthy cholesterol levels and better heart health, eating oatmeal daily also promotes stronger body and better colon health due to its richness in fiber. Studies show that having a healthy colon helps us work at our best throughout the day. A clean and healthy large intestine also makes us feel good on the inside plus it reduces the risk of colon cancer. “It’s packed with energy and keeps us full all day long. Plus, it has all the fiber we need for the day. It keeps us fit and at the top of our game,” Letts remarks. Australia Harvest Oatmeal comes in four variants. People on the go may simply add water to Australia Harvest Instant Oats, gulp it down, and get fit—anytime, anywhere! All-time best seller is the Australia Harvest Quick Cooking Oats — chunky and enjoyable oatmeal that cooks fast. Perfect for health buffs who seek a fuller fill and better digestion. The chunky and chewy variant, Australia Harvest Whole Rolled Oats is the oatmeal expert’s favorite! It has whole grains and full-packed with all of oats’ beneficial fiber and nutrients. Last but not the least is the super fiber of oats — Australia Harvest Oat Bran. The outer covering of the oat grain Oat Bran contains the highest level of dietary fiber. It is also ideal for diabetics and people with hypertension. Australia Harvest Oatmeal is available in all leading supermarkets nationwide, and is exclusively imported and distributed by Ideal Macaroni & Spaghetti Factory, Inc. Visit and like Australia Harvest Oatmeal’s Facebook page for updates, today. I have been wanting to write about food, as one of my passions is eating but I don’t know what food to blog for starter. At first, I was thinking of tasting different kinds of cupcakes as I was not a fan of cupcakes, only cakes. I know other may react but for me, there’s a big difference when it comes to consistency and texture of the pastry as cake textures are finer and moist than cupcakes. Back to my main topic. For the past few weeks, I was listing different pastry shops to visit but an accident occurred. I was hospitalized last Saturday. I don’t want to elaborate what happened but I just want you to know, I am okay now. Hospital bound for few days, craving for different kinds of food especially chocolates and cakes. My loving friends brought me what I want and I love them for that. 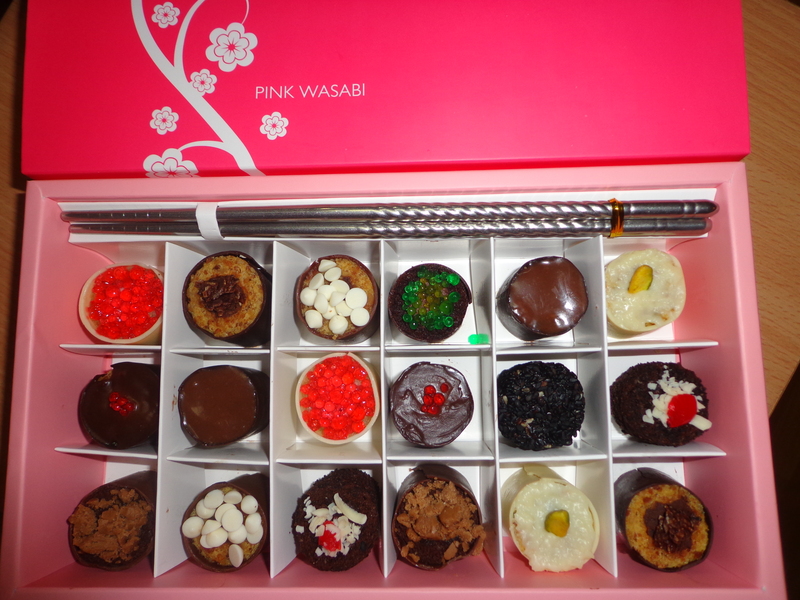 Enjoying and indulging on my favorite foods for few days until my nephew, Joper Legaspi arrived with a cute pink box with a name of Pink Wasabi. 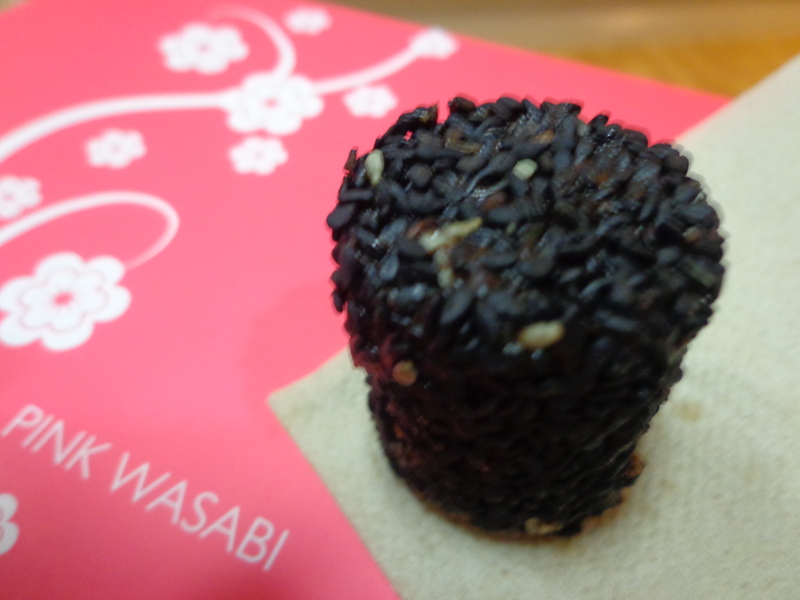 I asked him what’s in it, he said it was “kashi maki”. As a Japanese food lover and a sushi fanatic, I excitedly opened the box. 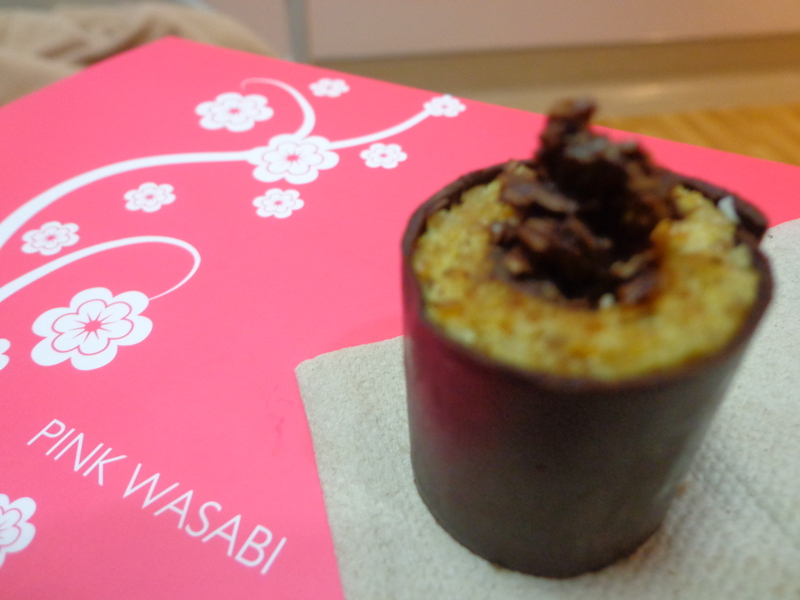 To my astonishment, it was not the usual maki and not a Japanese maki at all. 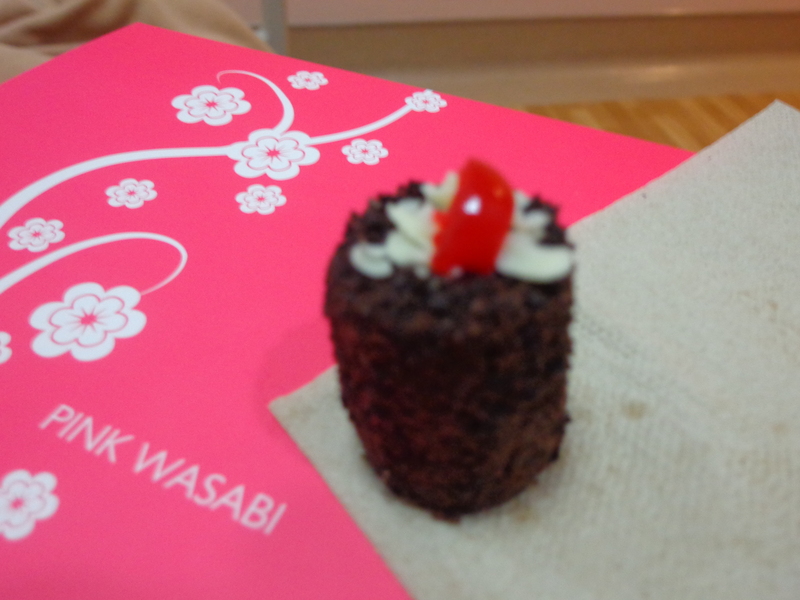 It was a sweet hand-rolled cake meant to look like maki sushi. The cute arrangement comes with a stainless pair of chopsticks. I taste it one by one and each one of them have different taste that so heavenly. Each have distinct taste. Each consists of layer of sponge cake and ganache wrapped with chocolate and topped with their flavored nuts, chips or jelly. Oolong berry – almond cake (consist of ground roasted almonds, ground cashew), white chocolate, strawberry puree, strawberry tea, white chocolate wrap, with strawberry jelly roe. I love almonds and I thought I was in heaven when I took a bite on it. The almond cake melts in my mouth. I love the combination of almonds and strawberry, leaving you an almond-after taste and I like that. Neptune’s weed– almond cake (consist of ground roasted almonds, ground cashew), dark chocolate ganache with seaweeds, dark chocolate wrap, dark chocolate covered pinipig. My first thought is “what?! seeweeds? !… eeeww!… but I was wrong. The combination of almonds and dark chocolate empowered the taste of seaweeds but giving it still a unique taste which I cannot further described but I like it. 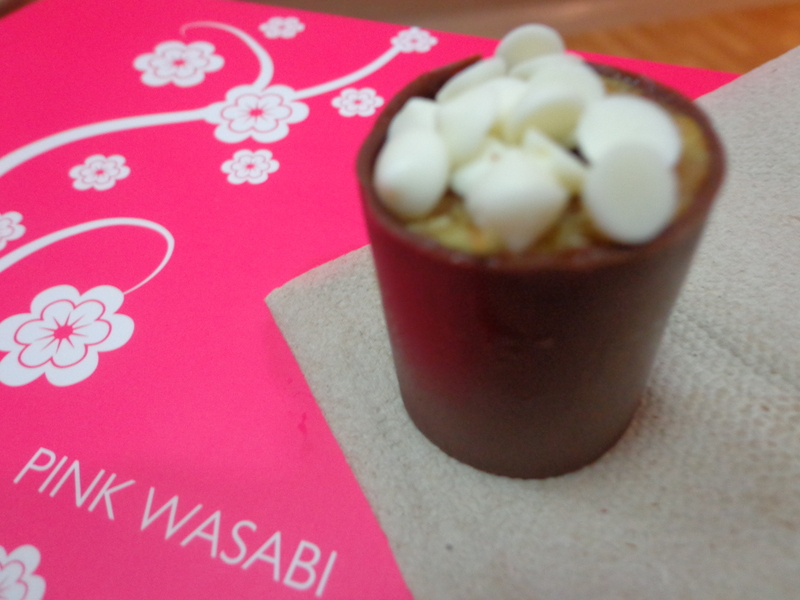 Coffee Kahlua – almond cake, milk chocolate coffee ganache with Kahlua, milk chocolate wrap, white chocolate chips on top. What can I say, combination of chocolate, coffee and liquor is superb with addition of my favorite nut, almond. 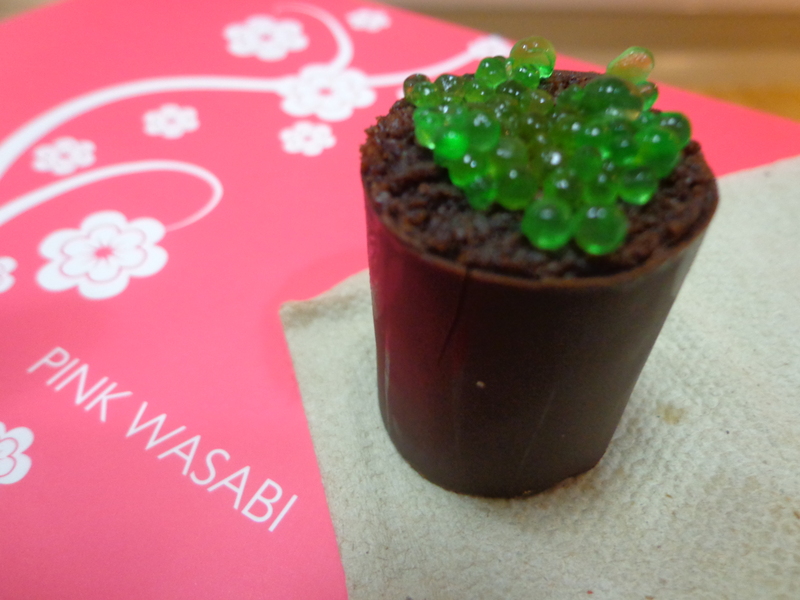 Midnight mint – chocolate cake, dark chocolate mint ganache, dark chocolate wrap, mint jelly roe. I am not a fan of mint on cakes and ice cream but this one, broke my preference. This is the first ever mint dessert that I like. Amarula – pistachio sponge (ground pistachio and cashew), milk chocolate ganache with Amarula liquor, dark chocolate wrap. As delicious as the Kahlua but of course it has unique taste as it has different liquor and the pistachio taste lingers in my mouth, yummy. Coconut dream – pistachio cake, white chocolate coconut ganache, half pistachio nut, white chocolate wrap. This is a like a pinoy macaroons due to the desiccated coconut with a twist, but the white chocolate and pistachio gave it a distinction. 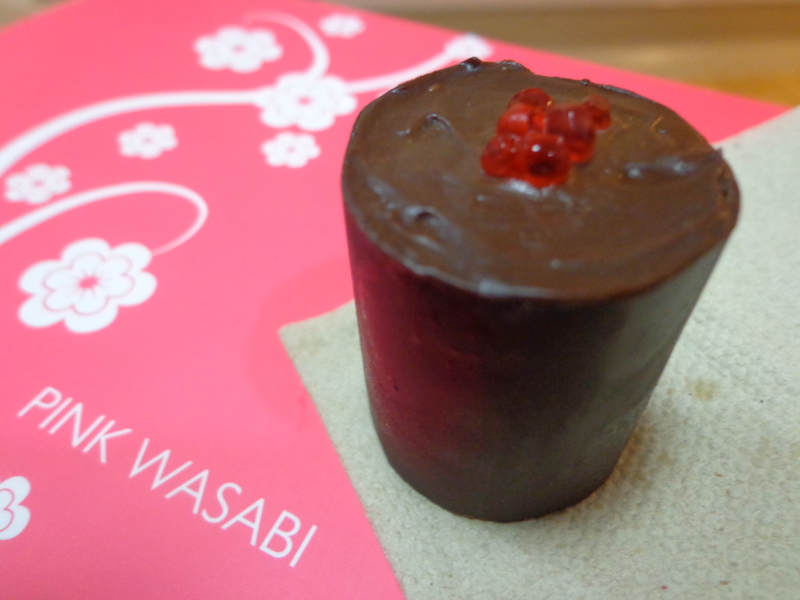 Murphy’s law – chocolate cake, dark chocolate ganache with raspberry vodka , dark chocolate wrap, strawberry jelly roe. Dark chocolate and raspberry vodka… should I say more? Nutella sesame – chocolate cake, dark chocolate Nutella ganache, black sesame. I love the after taste of dark sesame and the nutella make it more delicious. Cookie kiss – chocolate cake, white chocolate cherry ganache, cookie crumbs, white chocolate curls, cherry on top. 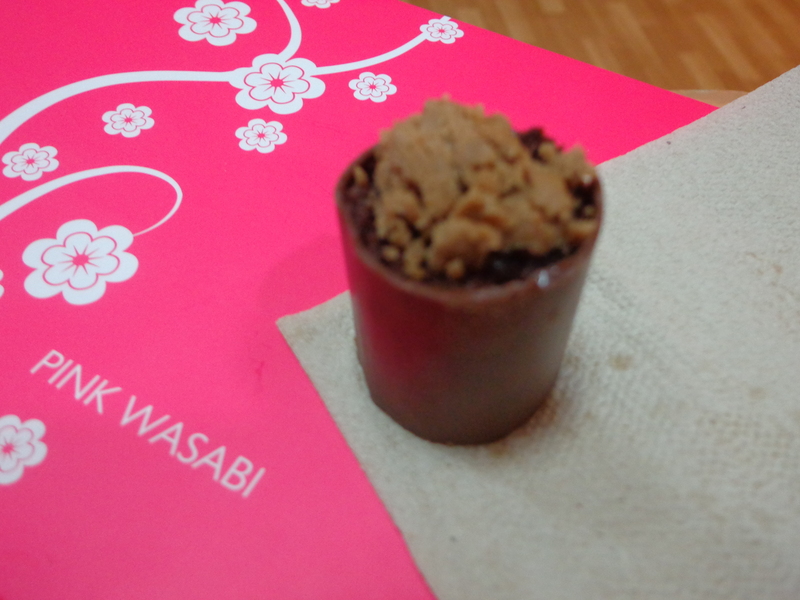 This taste like black forest cake but I like its texture more than an ordinary black forest cake, it melts it my mouth. Chocnut – chocolate sponge, peanut butter, milk chocolate wrap, Choc-nut bits toppings. I always love Choc-nut, combining it with peanut butter and chocolate makes me love it more. 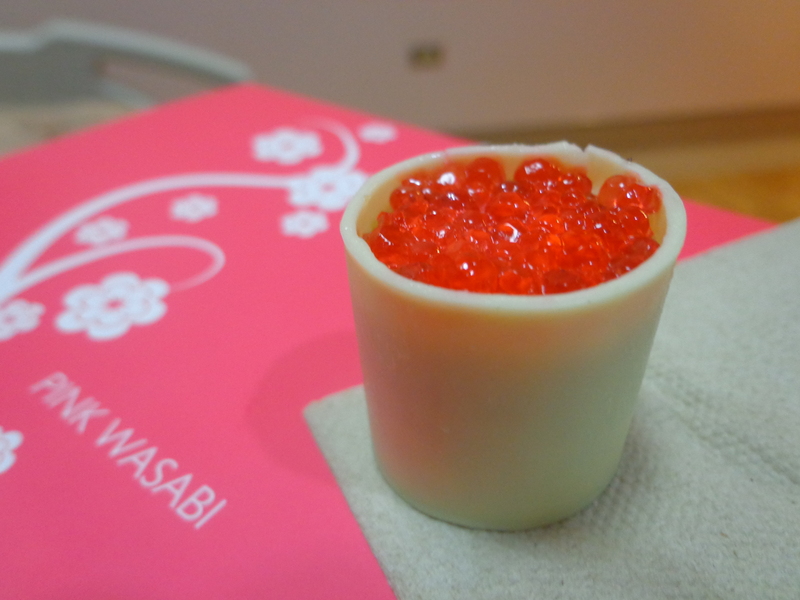 Kashi is the Japanese word for sweet and Maki or Makizushi is a cylindrical-shaped sushi. 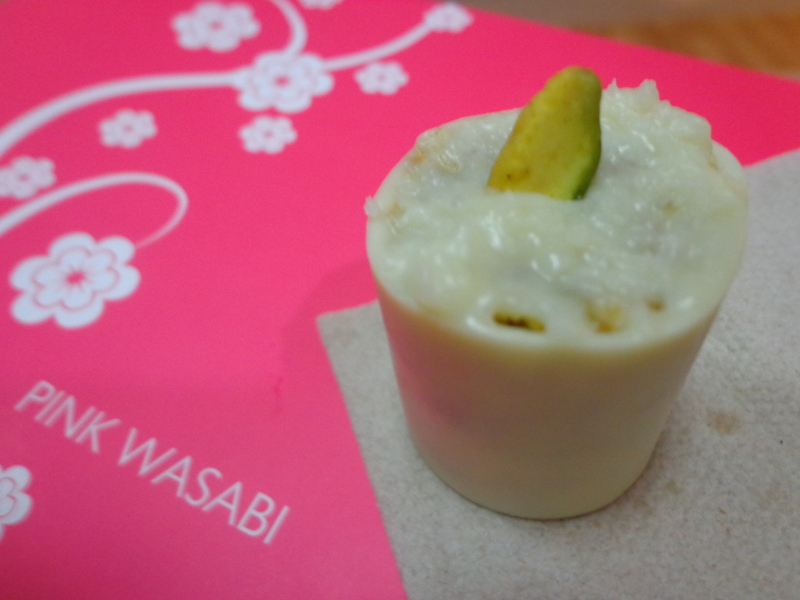 The dessert was made by “My Pink Wasabi”. 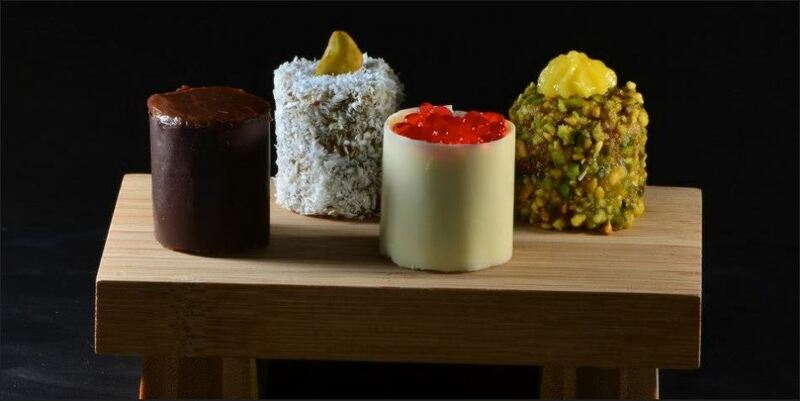 Their idea is to create dessert line which perfectly describes the sweet fusion of desserts with simplicity and perfection of sushi (as their tag line). They have a shop at The Collective at San Antonio, Makati City. They also have their delicious desserts served at Moonleaf Tea Shop UP Teacher’s Village and Fior Café at SM North Annex. But if you are far from the said shops, do not worry, they make it convenient to all, they also cater deliveries. 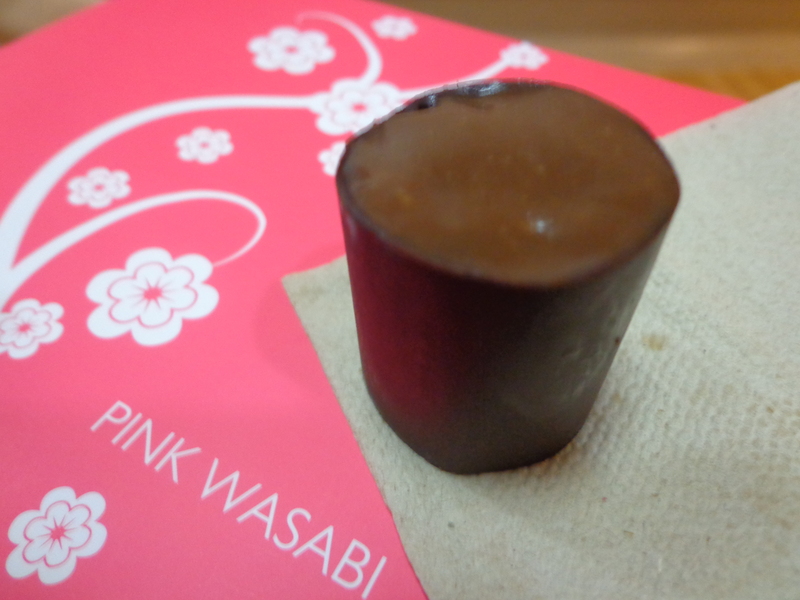 Just visit their website www.mypinkwasabi.com for full details. 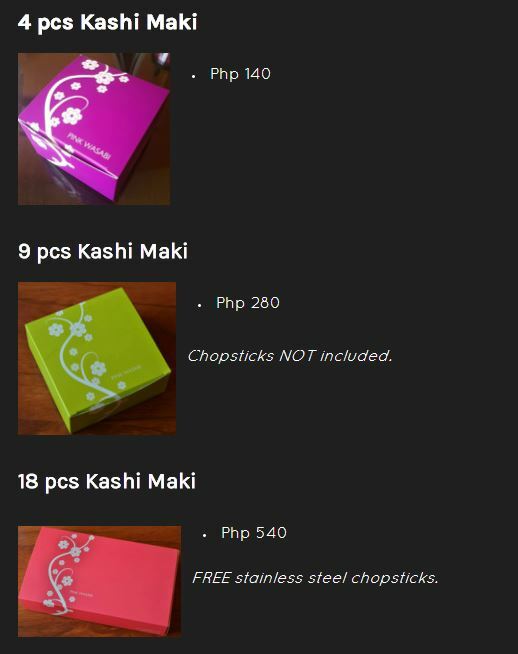 Kashi Maki comes in box of 4’s, 9’s and 18’s.